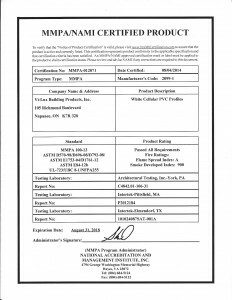 Vi-Lux Building Products Inc. becomes the first company certified under the new Performance Standard for Plastic Mouldings and Trim. 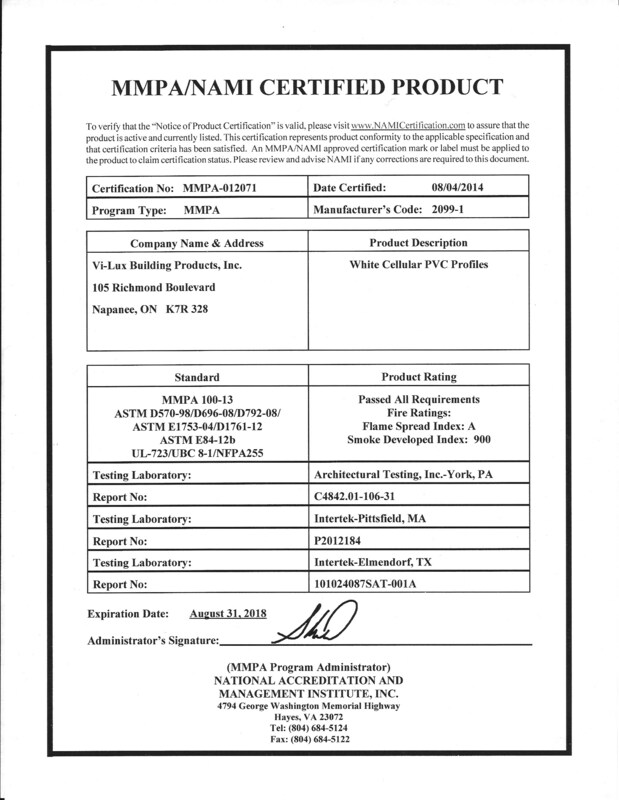 Vi-Lux Building Products Inc. is pleased to announce that it has become the first company to be certified under the new performance standard for plastic moulding and trim under the MMPA/NAMI Plastic Moulding and Trim Certification Program. The MMPA/NAMI Plastic Moulding and Trim Certification Program is based on a voluntary specifications that establish the minimum requirements for color consistency, dimensional tolerances, density, lead content, expansion/contraction properties, water absorption, optional flame spread and smoke development for, but not limited to, polyvinylchloride (PVC) and polyurethane products used within the plastic moulding and trim industry. The MMPA/NAMI Plastic Moulding and Trim Certification Program requires the plastic moulding and trim be tested to MMPA 100-13 standards. The Moulding & Millwork Producers Association (MMPA) is an international trade association for manufacturers of hardwood, softwood, MDF and Poly mouldings, interior and exterior door jambs and frames, plank paneling and related millwork products. Formed in 1963, the MMPA established a Poly Blends Group within their membership in July 2006. This group worked diligently over the past 8 years to come together to form the MMPA Standard/Specification for Plastic Moulding and Trim which is facilitated by the National Accreditation & Management Institute (NAMI). Vi-Lux Building Products Inc. is a manufacturer of cellular PVC profiles and trim that has been servicing the building material, window and door industry for over 25 years.